Thousands strolled, biked, skated, played, loitered and otherwise didn’t drive for six hours Saturday on no-vehicles-allowed Broadway — from Times Square to Union Square. Four-year-old Jack Novich played in the middle of Broadway at his mom’s and dad’s feet, petting a stranger’s greyhounds. Bicyclist Julianne Simson, 23, avoided the usual battle against cars invading designated bike lanes. David Zadeh, 73, polished off an afternoon of errands with people-watching in the sun. “This is my Champs-Élysées now,” said Zadeh, an antiques wholesaler who had just shopped at the farmers market for apples, honey, snapper and more. These New Yorkers joined thousands strolling, biking, yoga-ing, dancing, skating, walking, meeting, sitting, loitering, playing and otherwise not driving Saturday for New York City’s Car-Free Earth Day in Manhattan — from Times Square to Union Square, for six hours along Broadway, the city’s oldest north-south thoroughfare. The bags will be available at eight markets around Manhattan on Sunday. The third annual event is meant to show the urban possibilities of a streetscape bereft of cars. “I love it. It’s so incredibly pleasant. 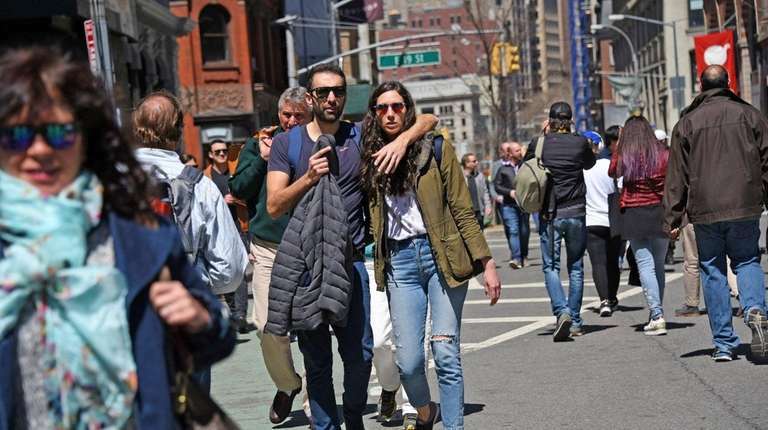 It’s just nice to not worry about cars,” said Battery Park City’s Kendra Manzo, 31, who works in online advertising, as she capped furniture shopping nearby with a walk down Broadway with her husband, Gerardo, whose arm was slung around her, and her visiting parents from Boston. The makeshift plaza reminded Gerardo, 32, who works in finance, of the weekends when streets in his native Italy boot cars for pedestrians. Had motor vehicles been rumbling along Broadway, as normal, little Jack Novich would never have met the greyhounds belonging to May Chan, 34, a spa manager who lives in Manhattan’s Chinatown. “Gentle, gentle, gentle,” Jack’s parents cautioned the boy, as he petted one of the dogs, fittingly named Houston, after the often-mispronounced Manhattan Street. Broadway’s car-free plaza, one of several around the city, came the day after Mayor Bill de Blasio announced that all nonemergency vehicles would be banned from Central Park beginning June 27, in a move to “help people return to what our ancestors used to know,” as de Blasio said Friday. At Saturday’s event, vehicles were periodically permitted to proceed across town — but NYPD cops enforced no turns. Native Long Islander Dylan Seeger, 23, now of the Upper East Side, used an expletive to inveigh against cars when approached. He said he never bothered learning to drive, knowing he’d want to move to New York City someday. Cars, Seeger said, “run the streets most days. One day out of the year, it’s fine” to give pedestrians control. For all the car-free love, Zadeh, the antiques wholesaler, was sort of cheating: He had driven his 2014 Lexus GX SUV for those errands, and parked it in a paid garage on nearby 17th and Park Avenue. Central Park car ban to begin this summer: Mayor"Our parks are for people, not cars."